A Leading Material Handling Solutions Provider. 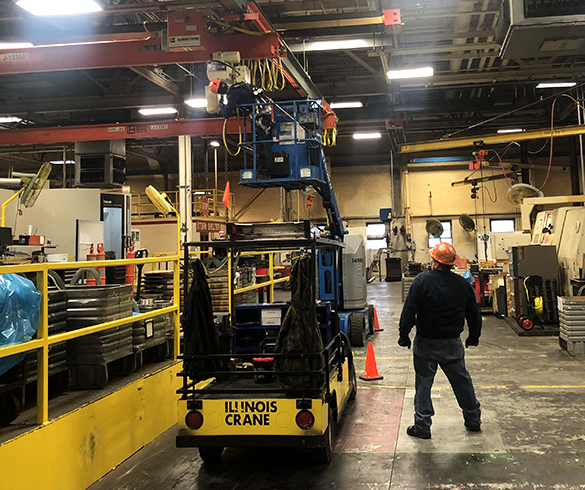 The beginnings of today’s Illinois Crane dates back to 1925, When Mason W. Haigh opened a distributorship for Cleaveland Tramrail Equipment, offering the newly-emerging industrial world of Central Illinois innovative material handling products. Products that are designed to make manufacturing more productive! Through the Great Depression of the 1930s…During World War II… and finally The New Deal, a period of history when the industry really began to flourish, Mason Haigh’s company not only survived some very tough times, but the company grew, offering more and more products and services that made the manufacturing process easier for its customers. The years following World War II saw even great need for factory automation, and Mason Haigh’s material handling specialists worked hard to meet the demands of improving factory productivity. The company not only met the challenges of the burgeoning industrial revolution but also at the same time, built on its reputation of customer satisfaction. The company became known as a single source supplier of quality cranes, hoists, monorail, and conveyors… providing reliable equipment designed to meet the ever-growing needs of medium-to-heavy industry. To this day, growth and change continue at Illinois Crane. The same vision that was present at its founding stage still exists today, as the company continues to look for new ways to better serves it’s customers, through expanded service, Inspection and training programs. With a continuing emphasis on helping customers achieve success, Illinois Crane Incorporated is your key to ” Moving Manufacturing Forward” in the midwest! The company name was changed to Illinois Crane, Inc.